Cascade ActionPacs power away greasy residue for sparkling dishes in one easy-to-use, premeasured pac. ActionPacs combine the scrubbing power of Cascade and the grease-fighting power of Dawn to leave your dishes virtually spotless with a brilliant shine. Formulated with built-in rinse aid action plus water softeners to help prevent hard water deposits on glasses, ActionPacs dissolve in your dishwasher to leave virtually no mess-only sparkling dishes. Simply load your machine, pop in a pac, and go! 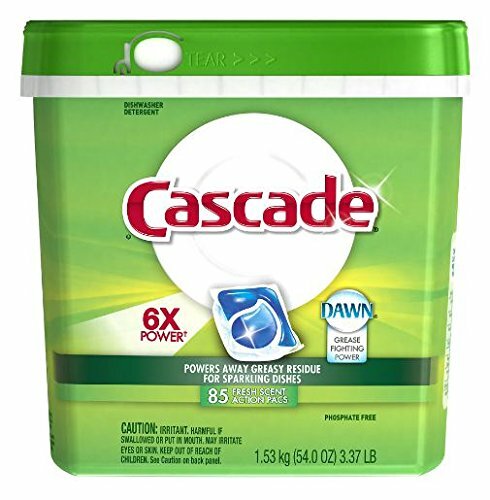 If you have any questions about this product by Cascade Dishwasher Detergent 6X Power Action Pacs, contact us by completing and submitting the form below. If you are looking for a specif part number, please include it with your message.